HORSES ARE AS AT HOME ON OUR PASTORAL ACRES AS OUR HORSE LOVERS AND OWNERS. Picturesque white paddock fences, majestic Live oak trees, and a red barn with horses grazing in the pasture provide an unforgettable and serene gateway into Oldfield. The Equestrian Center welcomes riders and boarders of all levels, ages, and disciplines. Learn new skills by taking a lesson or enjoy a leisurely ride on Oldfield’s trails, which meander through the property and around our lakes and ponds. Or simply come out to meet the horses and our barn cats and chickens. For Members who own their own horse, we offer a first-class boarding facility in which our staff will provide your horses with quality care and premium feed and hay. Our facility boasts twelve 12’ by 12’ rubber matted stalls with automatic waterers and individual fans. The barn houses three tack rooms, hot/cold wash racks, and an automatic fly spray system. The Equestrian Center also features a full jump course and sixty-foot round pen. 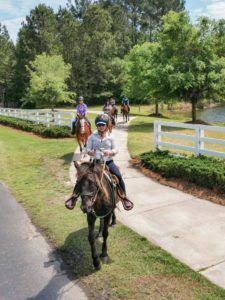 For children and visiting grandchildren, we offer multiple opportunities during the summer to participate in week-long or partial-week horse camps where learning and fun go together for young riders of all ages and skill levels.